In terms of design for manufacturing, laser-cutting technology can have a beneficial effect on any product. Cost and quality are two major influences on the marketability of any product, and laser cutting allows for high-quality components at a lower cost overall, therefore making it possible to offer a more affordable, better quality product. The idea of design for manufacturing (DFM) isn’t really new. For decades, manufacturers have sought to make the manufacturing process easier and more efficient by verifying that a design can actually be manufactured early on in the development process, saving time and money, and speeding up time to market for new products while also ensuring optimum productivity. Most DFM efforts have focused on simplicity; that is, attempting to reduce the complexity of designs to prevent complications in the manufacturing process. As a general rule, the more complex a design, the more difficult it is to manufacture — and with difficulty, comes costs. However, the development of new technologies such as laser cutting have made the manufacturing of more complex products easier. Rather than simplifying the products themselves, laser cutters have simplified the process of manufacturing products simpler, thus allowing for greater complexity in less time — and increased innovation. In general, laser cutting does offer some substantial benefits to the manufacturing process. For starters, laser cutters can be customized to cut nearly any material of any thickness to exact specifications. It’s fast, accurate, and can be quickly and easily adjusted to meet the changing needs of the market or a specific product. It’s also a cleaner process than most cutting options, as it requires little to no secondary cleanup. Of course, there are some drawbacks, as it does use more power than other types of cutters and does require more training to do properly, as poorly adjusted lasers can burn materials or fail to cut them cleanly. And while laser cutting does typically cost more than other types of processes, such as wet cutting, the benefits often far outweigh those costs. In terms of design for manufacturing, laser-cutting technology can have a beneficial effect on any product. Cost and quality are two major influences on the marketability of any product, and laser cutting allows for high-quality components at a lower cost overall, therefore making it possible to offer a more affordable, better quality product. Laser cutting also allows more flexibility in the manufacturing process. A laser operates with a heat intensity that is several times hotter than the sun, making it possible to cleanly and accurately cut virtually any material, from the strongest alloy all the way down to the thinnest polymers. This flexibility contributes to design for manufacturing process, as engineers aren’t limited in the scope of materials they can use. Rather than having to choose materials based only on their cost or availability, manufacturers can choose the exact materials that are best for the job. Laser cutting also allows for more creativity in product development processes. Lasers aren’t bound by geometry, so parts do not have to conform to the capabilities of the laser cutter. Because the laser itself never actually touches the part being cut, materials can be oriented in any fashion, which allows them to be cut in any shape or form. In many cases, the precision cuts made by the lasers require little to no post-cut processing, which also speeds up the manufacturing process. 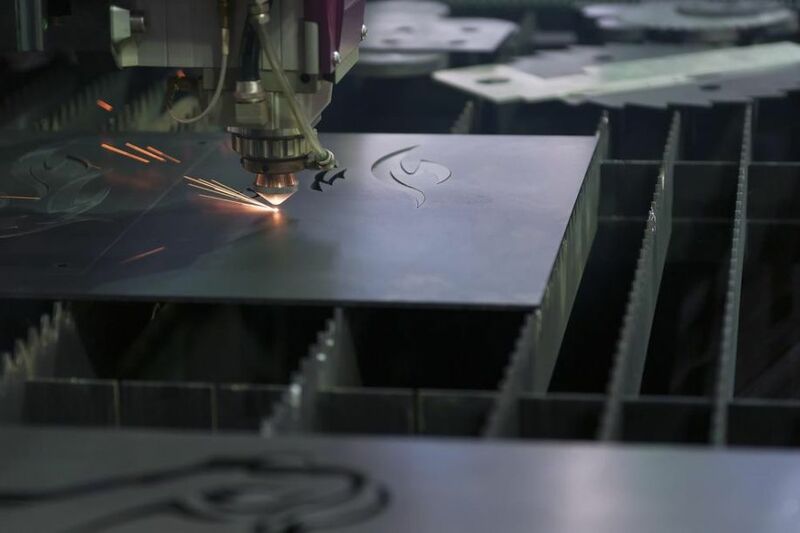 While laser cutting is a useful tool when it comes to design for manufacturing, there are a few things that engineers need to consider. The first is the possibility of over-engineering. Often, an engineer who understands the capabilities of a laser cutter will design parts or products with exceptionally tight tolerances. While there are times when a 5/1000th of an inch tolerance is necessary, often a 1/16th of an inch tolerance is adequate. The tighter tolerance will increase the cost and production time of a product, and potentially lead to waste. Choosing the right materials is another consideration. Again, just because a laser can cut a material doesn’t mean that material is right for a particular project. Designing for manufacturability means ensuring that the design can actually be brought to life. Choosing the right materials can mean the difference between a design that can be manufactured and one that cannot. Laser cutting is just one technology that is beneficial to the design for manufacturing process. However, it’s become a vitally important one, and has helped many products reach market more quickly and with less cost.